As a wedding gift, my brother Mark and his wife Lori gave us a spectacular afternoon in Venice. 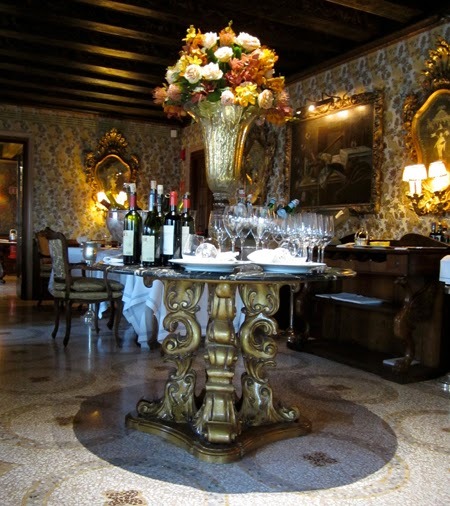 Their gift was a luncheon at the Club del Doge Ristorante in the Gritti Palace, with wines for each course. 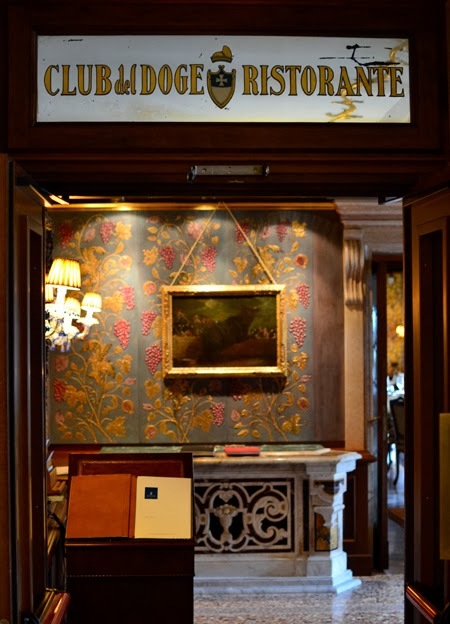 Not having been to the Gritti Palace, we looked online to see where we were headed and found perhaps the most beautiful palace hotel in Venice. When the day came, we arrived at the Club del Doge around 1:00pm; we were the only two people there. (The dining room eventually filled.) They gave us the choice of any table in the place. 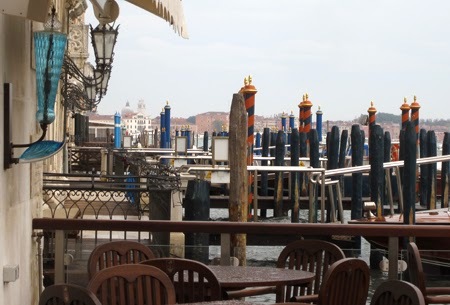 We, of course, chose the table with the French doors looking across the terrace onto the Grand Canal. We had hoped for outdoor-dining weather, but the weather gods had a different plan. 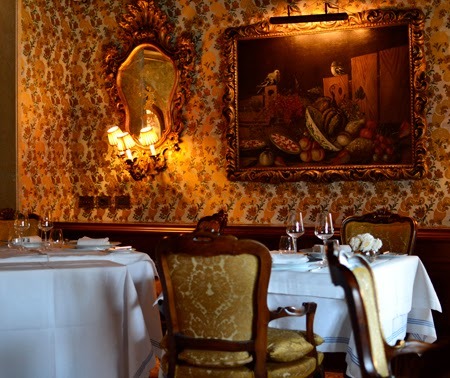 The walls of the sumptuous dining room were lined with hand-woven fabric by Bevilacqua in rich gold, ochre, and brown tones. The tables were set with crisp white linens, bordered with grayish-blue that matched the house porcelain. 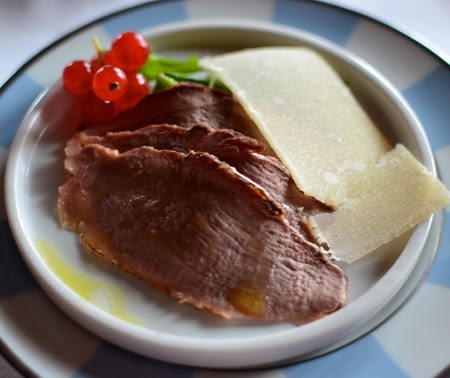 The three-and-one-half-hour meal opened with an amuse-bouche - three slices of beautifully-cooked beef with arugula, a sliver of cheese, and a small bunch of currants. It bode well for the rest of the meal. 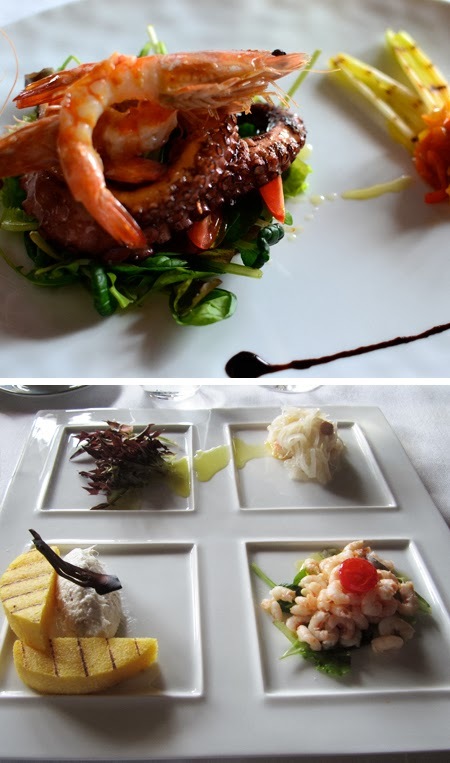 Our first courses: I had grilled king prawns and octopus on a bed of lettuce, with a side of grilled leeks and peperonata. I have never had shrimp so sweet, or octopus so tender. Mark had the plate of four cicchetti. 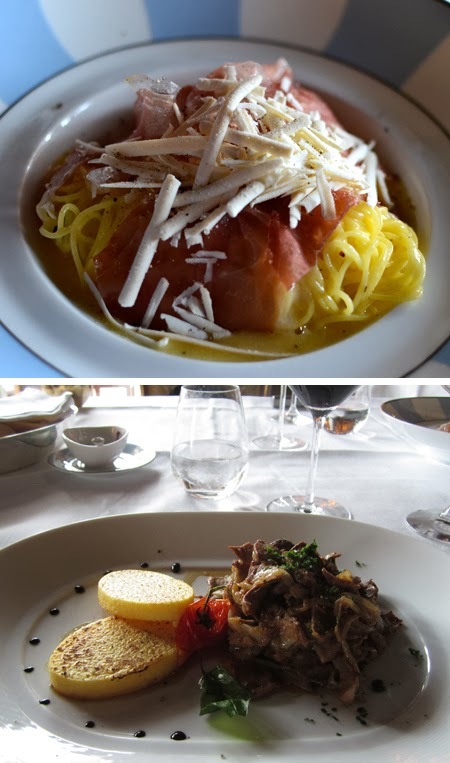 (If you missed my post last week on cicchetti, you can find it here.) Mark's four were: gamberoni in saor (a take on sarde in saor – in this instance shrimp and onions marinated in a vinegar-based sauce), a salad of baby shrimp, a green salad (actually dark red), and baccalà mantecato - creamed cod, usually served on toast but, in this case, on the local specialty of grilled polenta. For our main course, we again chose differently. I opted for a pasta called spinosini (similar to angel hair) with lemon, butter, and prosciutto topped with grated smoky mozzarella. The waiter said it was light but, with all that butter, I didn't really need to eat for the rest of the day (but of course I did)! 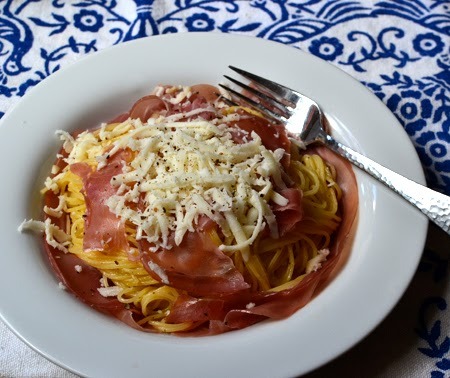 The pasta was tossed in a butter/lemon sauce, then placed in a prosciutto-lined bowl, topped with more prosciutto, and topped again with grated smoky mozzarella. Mark chose the traditional Venetian specialty of liver and onions. It was excellent, much less sauced than in other restaurants we had had it, and very appealing on that raw, autumnal day. 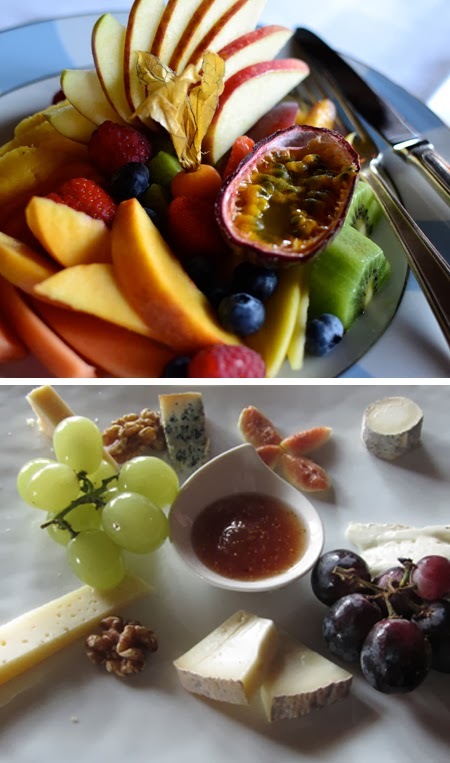 For dolce, I opted for the fresh fruit plate - perfectly ripe apples, peaches, plums, mango, papaya, passion fruit, kiwi, raspberries, strawberries, blueberries, pineapple, and one groundcherry. The platter in front of me was practically overflowing with vibrant color and flavor. Mark had the cheese and dried fruit plate - six cheeses in varying states of ripeness, and all unfamiliar to us. His plate included a fresh fig, grapes, fig jam, some sultanas, and one perfect walnut. The wines were also quite good. The white from Vicenza in the Veneto, was similar to a sauvignon blanc, but less fruit-forward. The red, also from the Veneto, was a Masi Campofiorin. I feel as though I have seen Masi wines in the States, so I will look for it. It was an amazing, full-bodied red, but not too tannic. It went really well with both our meals. 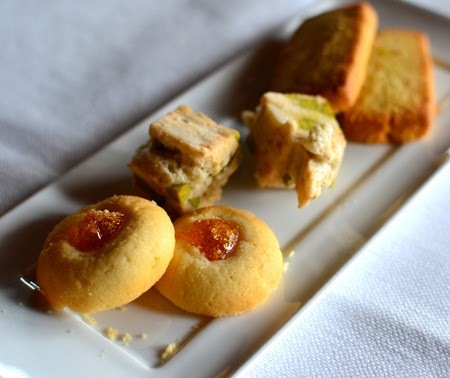 As if our desserts were not enough, they presented us with a plate of cookies - very Italian in style, not too sweet, and just the right touch after a big meal. A walk down the hotel hall (of fame) adjacent to the restaurant had us gazing at signed photos of the illuminati who had stayed there - from Gregory Peck, Rod Steiger, Marlon Brando, Natalie Wood, Woody Allen, Mia Farrow, and Lauren Bacall, to Branjolie, Michael Jordan, Tom Cruise, and Nicole Kidman. It seemed that pretty much every stage and screen artist from the last couple of generations has stayed or dined there. To add some lustre to the display, we autographed our menu for them to post with our photos... look for it next time you are there! Thanks, Mark and Lori, for this unbelievably special experience in Venezia! Line 4 pasta bowls or soup plates with half the prosciutto (2 slices per bowl). Melt the butter in a large skillet and add lemon zest. Keep warm on low heat. Generously salt the boiling water and add spinosini. As it cooks in 3-4 minutes, watch it carefully. Reserve 1 cup pasta water. Drain pasta and place immediately in the butter and lemon. Toss to coat and add reserved pasta water little by little, if needed, to get a good consistency. It should not stick together. Divide among the 4 prosciutto-lined bowls. Top with the remaining slices of prosciutto and coarsely grate with smoked mozzarella. Finish with a grind or two of black pepper. ** European-made butters have higher butterfat and much less water, not to mention a superior taste! My favorite brands generally available in the States are Président and Celles sur Belle (French), Jana Valley (Czech) and Kerrygold (Irish). Now that's a stunning lunch! Pity about not being seated outside but you know, when you're still in view of the Grand Canal, there's little to complain about. Every dish you guys had sound divine. Especially the liver and your spinosini. 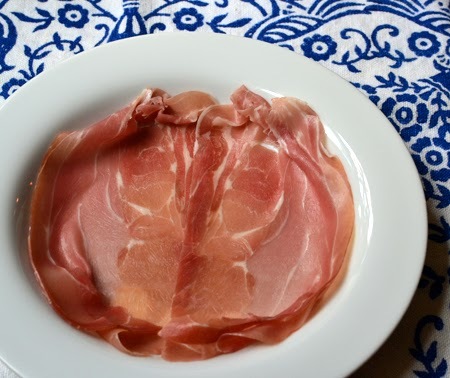 I love the idea of lining the bowl with prosciutto! I figure we can always sit outside NEXT time, right? ... We both love the Venetian-style liver, and simple pastas like this one are often my favorites. Glad you enjoyed the lunch vicariously, John! That perfect lunch, what an amazing wedding gift! People who take the time to think of such a thoughtful gift, so much more gratifying because it's a memory more than a thing, are priceless. So happy they're part of the family! Love the pasta dish you made, so very italian! 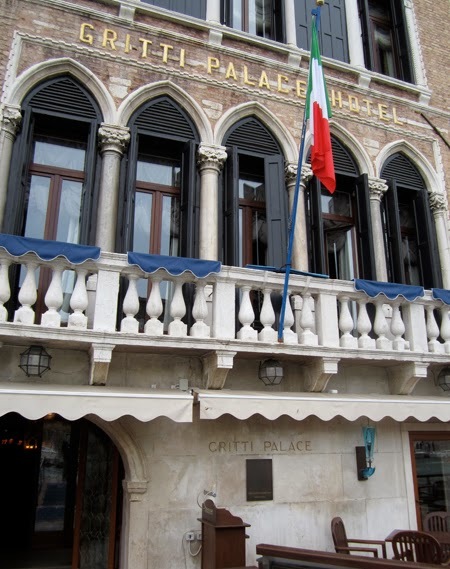 And, just because I like the coincidences between us, the time I was in Venice I stayed at the Gritti Hotel! And spent my birthday having dinner and sipping wine in the terrace The weather was gorgeous though! I'll try to find a picture and email it to you. What a beautiful gift and exquisite meal and experience. And Mark looks so handsome! Thanks, Patrician! I couldn't resist putting in the photo of Mark - someone said it should be the photo on his book jacket! What a lovely way to celebrate. Congratulations!!! You make me want to jet off to Italia! We love the same brands of butter, D. Have you try Lurpak fr Denmark? That is known as "The Baker's Butter." Thanks, Colette - I will try to find Lurpak right away! 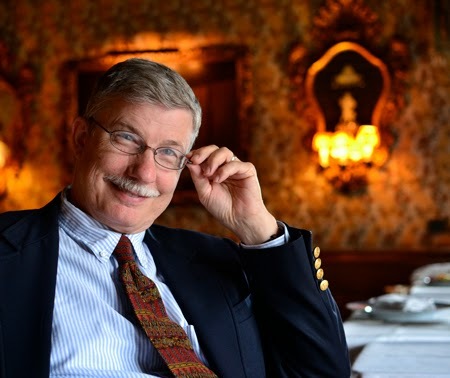 Dear David, amazing and absolutely wonderful pictures of your marvelous lunch in Venice - I actually know that hotel, would you believe it, I was there once, in another lifetime it seems - I am so very happy for the both of you that you received such a wonderful wedding gift! And I really like your recipe for the Italian pasta - how elegant to line the bowls with that delicious Prosciutto! All the very best for today - wie läufts denn in der Weihnachtsbäckerei...today is the fisrt day of Advent and we lit the first candle on our Advent wreath - such a very special time of year! Oh yes, we have City of Falling Angels. Mark read it while we were there, and I am reading it now. It was very special to be in La Fenice for a performance, too. What a thoughtful gift. Although I'm not surprised you have thoughtful friends as you as so thoughtful yourself! I think I need to go there just for those thumbprint cookies. Oh and totally agree on the butter - I've recently become addicted to Kerrygold. Will keep my eyes out for the others. Ahu - those cookies were the most tender shortbread I have eaten - and not very sweet at all. Most of the sweet came from the jam... they were very Italian! Terrific photos--I particularly love the shot of that handsome fellow at the end! What a place! What a meal! The recipe looks super easy, too! Thanks for sharing so much with us! Susan - it was really a fun meal - and we look forward to returning on a sunnier day! Now that's a wedding gift! 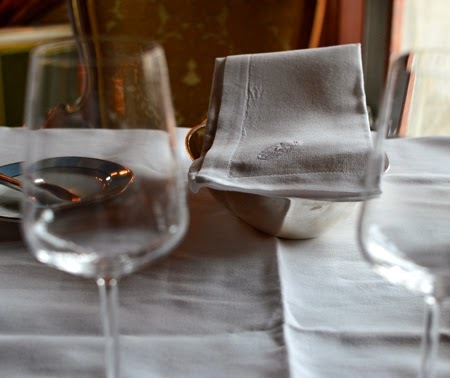 What a wonderful experience and the photos of the meal and hotel are gorgeous David. Everything looked fantastic and I bet the whole experience added to the fun. What a lovely lunch. Thanks, Nazneen - it has been fun having you all celebrate with us! One more Venice post to go! Yeah, it was pretty nice, Valentina! What a lovely and thoughtful gift. It sounds like a wonderful and memorable meal. 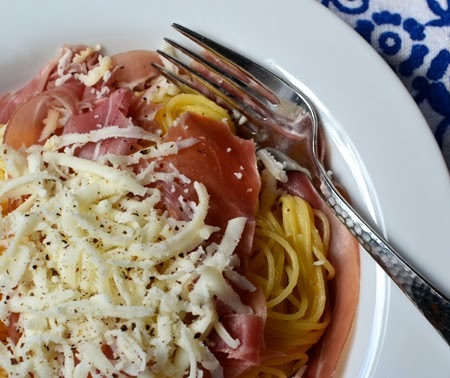 I love the idea of lining the bowl with the prosciutto before adding the pasta. I think lining the bowl with prosciutto (or any number of other cool things) got my - and a lot of other cooks' - attention. Just think of the possibilities! Thank you, dear friends - special celebrations are so much fun! That does it! I'm sending John to AZ so he can learn to make all of your amazing pasta dishes! Not only does this sound delicious, it's a work of art. What a wonderful wedding gift and a perfect way to celebrate. We're in San Diego for our nephew's wedding tomorrow. I'm so ready to be back home with my furry boys! I've really missed cooking & blogging. And, I'm still editing my photos from NOLA! Enjoy your weekend! Haha, Susan - I am SURE that is the last thing your amazing-cook-of-a-husband wants to hear! Looking forward to your NOLA posts - I am going to have at least 5! Wow! What an amazing meal. The space looks amazing. It was pretty amazing - we can't wait to go back! How lucky to grow up in such a beautiful place... and to have dined there with your mother. Glad I was able to bring back those fond memories.